One of my personal favorite days is “leg day”, in regards to weight training; nothing can really get the blood pumping more than a good leg workout. Hopefully reading this article can help you build out those legs into something very impressive. 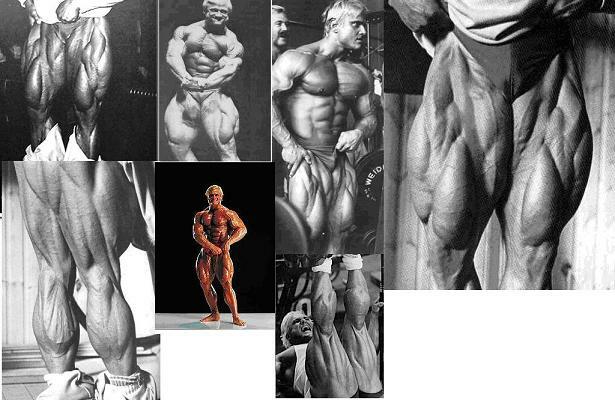 The leg is a very big muscle group; it is composed of 4 major parts: calves, hamstrings, glutes, and quads. 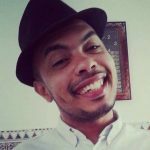 This article will aim to cover all four, to provide you with good literature to help advise and motivate you with your goal of big and cut legs. Your quads are comprised of four muscles: rectus femoris, vastus medialis, vastus lateralis and vastus intermedius. 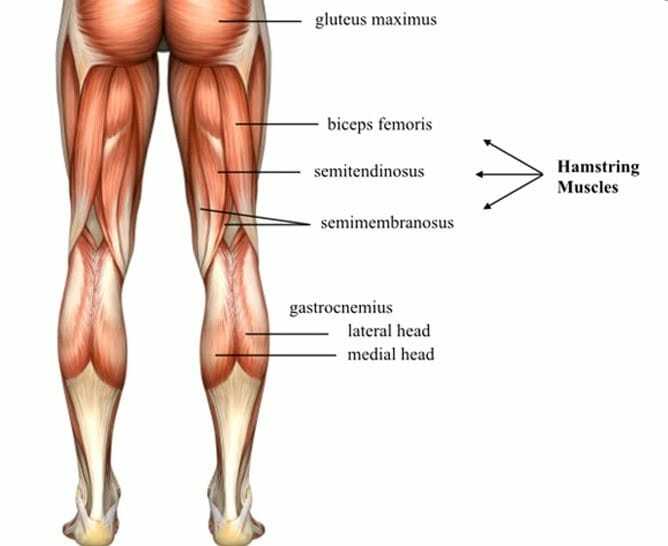 This group of muscles is found on the front of your thigh. They are found on the top of the femus and attach all the way down to the tibia. The only exception to this is the rectus femoris as this muscle originated on the pelvis and goes around the hip joint. A joint combination of thick/big muscles and low body fat will give you that cut teardrop look to your quads. The main function and purpose of the quadriceps: to straighten and extend the leg via the knee. The rectus femoris shares the same function and purpose but it also acts as a flexor for the hip. The quad is made up of four muscles, the rectus femoris can be found at the top of the thigh, directly below this muscle is the vastus itermedius. Either side of the vastus itermedius you will find the two remaining muscles, which run parallel to one another. The vastus medialis is found on the inside of the leg and the vastus lateralis is found on the outside of the leg. We’re going to go over all the different parts of the hamstring, so you have a better understanding on each specific part of the muscles. On the media side at the back of the thigh is where you will find the semimembranosus muscle, it comes from the hip at the tuberosity of the ishium, from this point it then goes down the back of the leg and onto the medial condyle of the tibia. Originating at the posterior and medial area of the thigh is the semitendinosus muscle, it comes from the same place as the semimembranosus, the slight difference is that it attaches onto the medial surface of the tibia. The biceps femoris is a muscle that has two heads to it, there is a long head and a short head. The long head originates at the inner impression of the tuberosity of the ischium, it then follows downwards until it attaches on the lateral condyle of the tibia. The short head section of the muscle originates between two muscles; the adductor Magnus and vatus lateralis. It then stretches up as far glute muscles at the insertion. The adductor Magnus is found on the bottom section of the ischial tuberosity and is attached to the tubercle, this is underneath the medial condyle on the tibia. The adductor magnusmain purpose is hip extension. The calf is made up of three muscles and one small muscle; The Gastrocnemius, Soleus and the Plantaris. The gastrocnemius is the muscle that you typically think of as the calf muscle, this is the visible muscle you can see in the calf, and it has two heads; the medial and lateral heads. The gastrocnemius muscle is attached from the Achilles tendon to the femur (which is situated behind the knee). and the long head is found on the posterior fibula. Both of these heads come together and join at the calcaneal tendon. and then inserts into the calcaneus. It is found at the lateral epicondyle of the femur which is just above the lateral head of the gastrocnemius. The main function of the gastrocnemius is the elevation of the heel (plantar flexion). It is used to push your weight off the ball of your foot, without this muscle it would be incredibly difficult to walk. 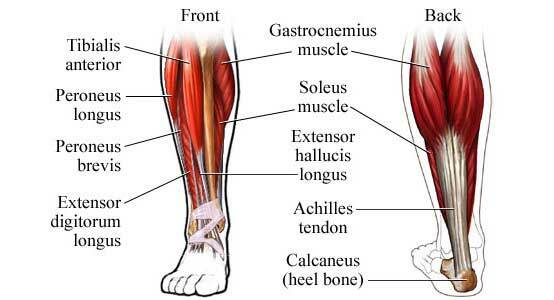 The soleus shares the same function as the gastrocnemius; lifting weight off the ball of your foot, i.e. lifting your heel. The only noticeable difference is the soleus is worked more when the knee is bent more. A good example would be seated calf raises. This muscle aids in the plantar flexion movement but is weaker in comparison to the soleus and gastrocnemius. Hopefully, this article has given you a better understanding of your leg muscles and will help towards building out your leg muscles with added thickness and width. 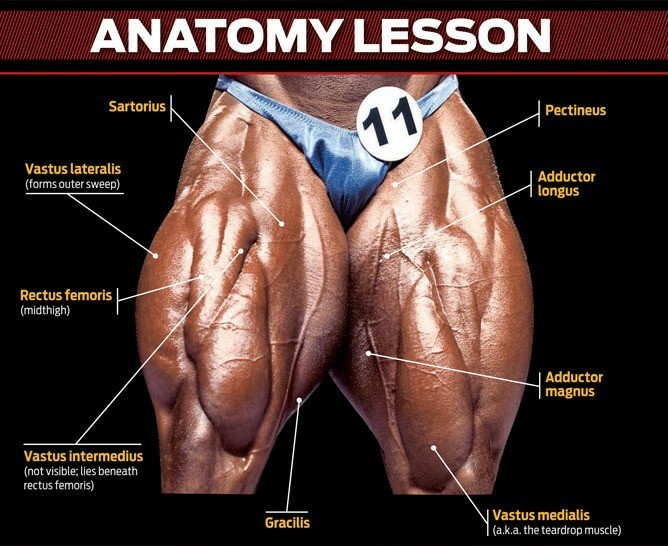 The legs can be an overlooked part of bodybuilding by regular gym “goers” so I hope this has inspired and educated some who neglect one of the best parts of the body to train. As always, it’s important that you use good technique and form when performing any leg workout. You really want to feel the movement you choose in your leg muscle and always aim for a good muscle contraction. If you aren’t achieving this than you’re either using incorrect form and technique or the weight you’re using is too heavy.